APPLE LAUNCH: Read all the news on the iPhone 4 launch as it happened | What Hi-Fi? 20.00: Jobs is wrapping up now. So that's it. No new Apple TV or music streaming on iTunes. Still, the new phone looks pretty nifty. Naturally we'll be bringing you a full review just as soon as we can get our hands on one. Right, we're off to get something to eat. Thanks for joining us. 19.45: At last, prices, at least for the US: 16GB is $199, 32GB is $299 (8GB 3G S is now $99). Available in the US and UK from June 24th. Pre-orders start a week from tomorrow. Not all features of iOS 4 are supported on the iPhone 3G and the second-gen iPod Touch (first-gen Touch doesn't handle it at all). The good news is that second-gen Touch owners will get the iOS 4 upgrade for free. iOS 4 will be available for current iPhone owners from June 21st. 19.35: One more thing... video calls. Jobs calls Jonny Ive and they video chat with each other on their new iPhones. Nifty. It's called FaceTime, and will work via wi-fi on any iPhone 4 to iPhone 4 calls with no set-up required. Wi-fi only at this stage. "We need to work a little bit with the [mobile phone] carriers," explains Jobs. Uses front and rear cameras, can be viewed portrait or landscape. 19.25: Jobs explains iAds "Why are we doing iAds? To help our developers earn money." Fair enough. iAds is built in to iOS 4. Apple sells and hosts the ads, which remain within the app. Share of revenue goes to the developer. Who's advertising? Nissan, Unilever, AT&T, Chanel, Sears, Best Buy, Disney among others. iAds will be turned on for all iOS 4 devices from July 1st. Jobs claims they've already got $60m of ads committed. He predicts iAds will represent 48% of the mobile advertising market in the second half of 2010. 19.15: And they're adding Bing! That is a surprise. It will be out soon, says Jobs. iBooks is coming to the iPhone 4 too. Same bookshelf display as on the iPad, PDF reader, iBookstore on your phone. You can purchase and download a book on iPhone and iPod touch. Plus you can download the same book to al your devices at no extra charge. iBooks will also allow you to add bookmarks and notes, and wirelessly transfer them between devices via wi-fi. 19.10: Details coming through of iPhone OS4. "The most advanced mobile operating system in the world." It's called iOS 4. Ho, ho. Includes multitasking (hurrah! ), folders. Jobs plays some music and checks email simultaneously. Unified inbox for email, as expected. 19.00: Next up, iMovie for iPhone. Add your own transitions, titles, photos, automatically records geolocation. Built-in video editing. Can choose from HD quality @ 720p, large @ 540p and medium @ 360p. App will cost $4.99 in the US. 18.55: Other features: Quad band HSDPA, 7.2Mbps, dual mics, 802.11n wi-fi, GPS, compass, accelerometer. They've added a gyroscope for gaming. Looks pretty cool. There's a whole new camera system too: 5 megapixels, as expected, but with a "backside illuminated sensor", LED flash, 5x digital zoom, tap to focus function. And it records HD video, 720p at 30fps. 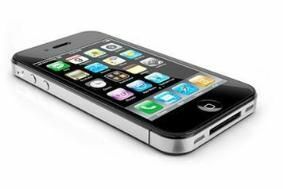 18.50: The iPhone 4 is powered by the A4 chip, Apple's own design. Bigger battery gives 7 hours of 3G talk, 6 hours of 3G browsing, 10 hours of wi-fi browsing, 10 hours of video, 40 hours of music. And 300 hours of standby. 18.40: Four times the number of pixels on the screen. Uses Retina Display for super-sharp text, images and video; 326 pixels per inch. Jobs demos iPhone 4.0 vs 3G S.
Claimed 800:1 contrast ratio for the screen (four times better than 3G S), 960 x 640 resolution, 3.5in display. Has 78% the number of pixels used on the iPad. "Awesome text, awesome images, awesome video," says Jobs. 18.35: "Now we're introducing iPhone 4. In 2010 we're going to take the biggest leap since the original iPhone. Glass on the front and back, steel around the sides. It's like a beautiful old Leica camera." "And it's 24% thinner than the iPhone 3G S."
He confirms front-facing camera, micro SIM tray and LED flash on the back. Plus noise cancellation mic. 18.30: Right, Jobs now says he'll talk about the iPhone. Here we go. He claims RIM has 35% share of the mobile market in the US, iPhone 28%, Windows 19%, Android 9% (according to Nielsen). New versions of Farmville and Guitar Hero coming to the iPhone/iPod Touch this summer. 18.20: Now Jobs want to talk about Netflix on the iPhone. Reed Hastings from Netflix is on the stage: "We've just launched Netflix for the iPad, and I'm happy to announce Netflix for iPhone coming this summer." Users will be able to pick up their viewing from where they left off when switching between iPad and iPhone. 18.15: "We support two platforms: HTML5 – it's a completely open, uncontrolled platform. And the App Store." No mention of Flash then, Steve. 18.05: As expected, Job starts with an update on the iPad. They're selling one every three seconds apparently. "It's a whole new way to interact with the internet, apps, content and media." There are now 8500 iPad apps in the app store. iPad apps have been downloaded more than 35 million times, which equates to 17 apps per iPad. 18.00: Delegates at the WWDC are being asked to turn off their moble phones. The man himself steps on to the stage. Let the fun begin! 17.45: Apple boss Steve Jobs is due to take to the stage at 6pm UK time to give his keynote address at Apple's Worldwide Developer Conference (WWDC), so we'll be posting regular updates here on the site as the news unfolds. What we know so far is outlined below, but we'll bring you confirmation of developments as soon as they happen. Will the new iPhone live up to the hype? Will we see an improved version of Apple TV? And will we finally get streaming music on iTunes? Stay with us throughout the evening to find out what's happening. 10.00: Steve Jobs is expected to unveil the fourth-generation Apple iPhone today at the company's Worldwide Developer Conference in San Francisco. Many details have already been leaked online after a member of Apple's staff lost a prototype in a bar near the firm's HQ. The new iPhone 4.0 operating system will allow multitasking, creation of folders, iBooks, iAd mobile ads and a unified email inbox. There is also speculation that Apple will stop making the 16GB and 32GB versions of the current iPhone 3G S, with the cheaper 8GB 3G S becoming the company's mainstream iPhone model and the new larger capacity 4G the flagship one. Jobs may also reveal a new, improved Apple TV and a cloud-based music streaming service for iTunes. We'll bring you regular updates from the Apple launch from 6pm tonight here on whathifi.com.